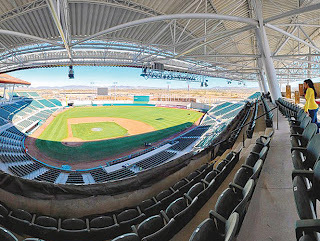 The Caribbean Series action begins on Friday with Hermosillo, Sonora, Mexico hosting the event. 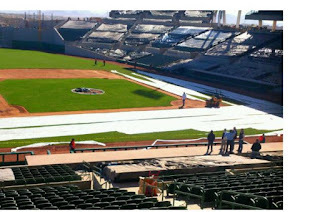 Friday also will be a special day for Dodger hero Fernando Valenzuela will throw out the ceremonial first pitch in “Estadio Sonora,” which is to be renamed “Estadio Fernando Valenzuela.” ( Article in Spanish announcing the renaming of the Stadium Linked HERE) The ball park has been modernized and remodeled for the Winter classic that will feature, Puertos Rican Representative, Los Criollos de Caguas (with Manager Alex Cora) , Los Leones de Escogido, Dominican Republic (that will feature Hanley Ramirez), Los Navegantes de Magallanes, Venezuela and Los Yaquis de Obregon, Sonora, Mexico. Final remodeling touches being completed on Hermosillo ballpark. Carribbean Series action begins on Feb. 1st. Fernando Valenzuela, a Sonora native out of a tiny dusty town of just a few families, named Etchohuaquila, is a true hero to the region. 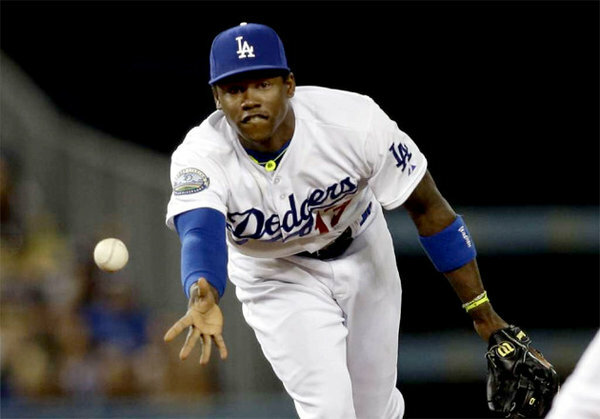 Dodger scout Mile Brito discovered him by accident, travelling among the circuits of the Mexican Central League, looking for a shortstop by the name of Ali Uzcanga, (now there’s an answer to a trivia question). He watched a game in the town of Silao, Guanajuato. This 1978 Mexican League game played before a one hand clapping no show crowd in Central Mexico featured Fernando pitching. He struck out 12 batters that night and Brito forgot about the shortstop. Brito contacted Al Campanis and Al took a trip to Mexico the next year after Brito continued to insist that he had found something special. Eventually, for $120,000, the Dodgers purchased Valenzuela from the Puebla ball club that Valenzuela was pitching for the following year in 1979. We all have heard the story of Bobby Castillo teaching Fernando the screwball and his miraculous rookie year. 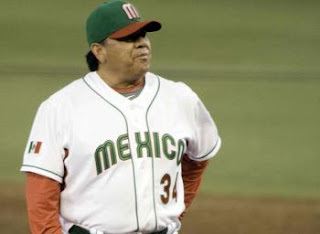 But few know of Fernando’s first few years in the Mexican League in ’78 and ’79. As an 17 year old kid pitching in Guanajuato, when Mike Brito found him, Fernando was 5-6, with a 2.23 ERA. 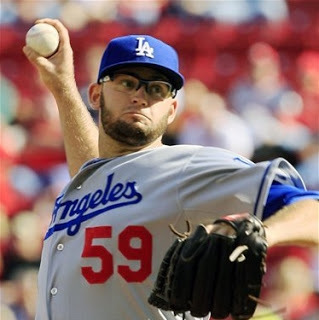 In the shortened season who was amongst the league leaders with 91 strikeouts. Fernando was recognized as something special in Mexico and sold to the superior Puebla club the next year where he continued to excel as an 18 year old. A victim of poor run support, Fernando went 10-12, with a 2.49 ERA, striking out 141 batters. Al Campanis wanted him and Puebla resisted for several months before finally relenting to Brito’s wishes and $120K. Mid year, Fernando was at Single A Lodi where his 1.13 ERA moved him up to AA San Antonio the next year. Last year, when I had the opportunity to briefly interview former Dodger outfielder/first baseman, Mike Marshall, he said this when remembering Fernando and his rise through the minors to his major league debut. 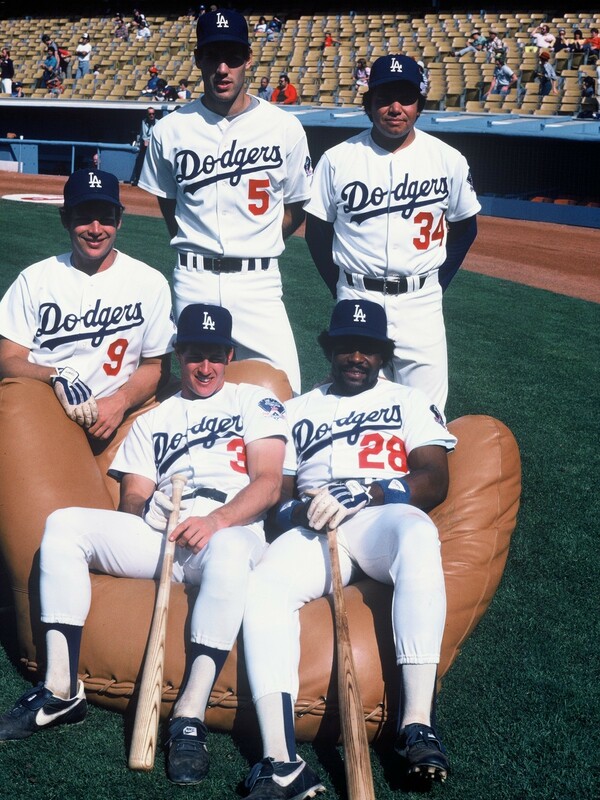 1983 Dodgers photo with Mike Marshall and Fernando Valenzuela in top row, Greg Brock in middle. Steve Sax and Pedro Guerrero seated. “Quick story. I’m in Reno, Nevada. I’m playing for the Lodi Dodgers and I’m 19 years old. It’s a half an hour before the game and they tell us that we signed a kid out of Mexico, he’s 19 years old and he’s pitching that night and I’m playing first base. It was Fernando Valenzuela. He had hair down to about here, (points to his shoulders). Big long black hair. He didn’t speak a word of English. He was from somewhere in Mexico and Mike Brito had signed him. He threw about 90 MPH. He had a curve ball. I think we got beat that night. It was nothing special. It was towards the end of the season. “So we went to Spring Training the next year and Bobby Castillo, a Mexican-American, right handed pitcher, taught him the screwball. And the next year we went up to Double A in San Antonio and it got a little more interesting, He still didn’t speak any English. He’s still drinking his Budweiser. He’s 20 now and Hershiser was on that staff. And all of a sudden he’s lights out. He’s up to the big club. He didn’t even go to Triple A. Next year there’s a bunch of injuries coming out of Spring Training and this kid could flat out pitch. With a screwball, change up, threw over 90 MPH. He’s a heck of an athlete and he’s the guy. That was another move by Al Campanis. He had no fear. You know Freddie didn’t even go to Triple A, he pitched opening day against the Astros, I think he struck out 12 or 13 guys and threw a 3 hitter, and Fernandomania starts. “You know, to see him at 19 and then the changes at 20. It just shows you that one pitch, just one little change, what can happen. And then to be a Mexican American pitching in Dodger Stadium in Chavez Ravine. The year the Dodgers won in ’81, I got called up at the end of the year. But to be a part of that. 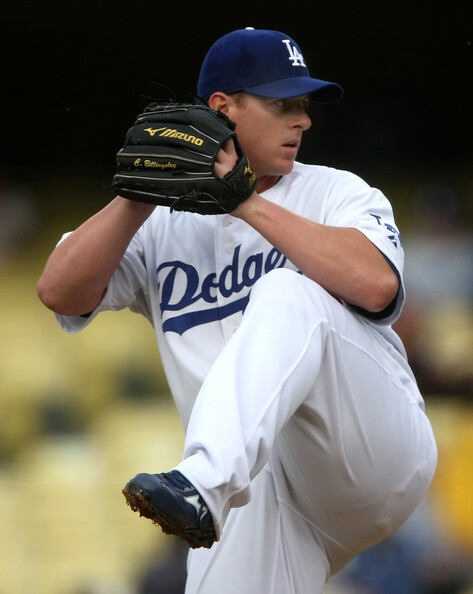 And then to experience something very similar with Orel Hershiser with dominating, dominating performances. It was special. Kershaw, Greinke, Beckett, Billingsley, and Ryu. Capuano, Harang, Lilly, Fife. That’s nine men who could pitch on major league staffs. We know that most likely not all will be healthy at the start of the season. We also know that it’s probably pretty a good bet that more than five will be healthy. Finally, I think it’s a pretty good bet that one or more will be pitching in another major league uniform when April 1st arrives. I listed the pitchers in the order that I see them ranked on the staff. Working backwards, let’s see where they could end up. Stephen got a taste of what it’s like being a Dodger starter and that usually means zero run support. In his major league debut against the Phillies, he outpitched Roy Halladay, leaving the game with a 2-1 lead after six only to watch the bullpen cough up the lead and take a loss. There was more of that to come as he had quality starts against San Francisco, St. Louis and Cincinnati. All this resulted in an 0-2 record over five starts with a 2.70 ERA. Unless the injury bug attacks half of the starters signed, Fife is bound for another year at Albuquerque where he was a respectable 11-7, 4.66 in the altitude. Fife will turn 26 in 2013, so there’s still time for him to be considered young enough to break with a Major League staff. I liked this kid’s composure last year when he was thrown out there in the middle of the playoff hunt. Who knows? Maybe the Dodgers could have used him down the stretch. Very few minor league pundits consider Fife to be a quality prospect and he seems to be looked over the top quality minor league pitchers in the Dodger organization such as Lee, Gould, Reed and maybe even Withrow. His stuff isn’t electric and he is projected to be at best a number 5 reliever or long reliever on the major league level. One thing to remember though is that sometimes the guys with the mediocre repertoire and lack of an out pitch, (pitchers like Doug Rau, Geoff Zahn and Kirk Reuter), turn out to be stalwarts in major league rotations for years. A pitcher with the make up to be at the back end of a major league rotation. Lilly started 2012 like gangbusters. Throw out his last start, when he pitched injured and got shelled for 8 earned runs in three innings and his numbers were spectacular. 5-0, 1.79 ERA, seven straight quality starts. But try as he might to return late in the season, Ted couldn’t do it. Set back after set back arose. Truth is, we have no idea if Lilly will ever be back. He’ll be 37 years old this season. He hasn’t pitched out of the bullpen since 2001 and it’s difficult to imagine him cracking this starting staff. 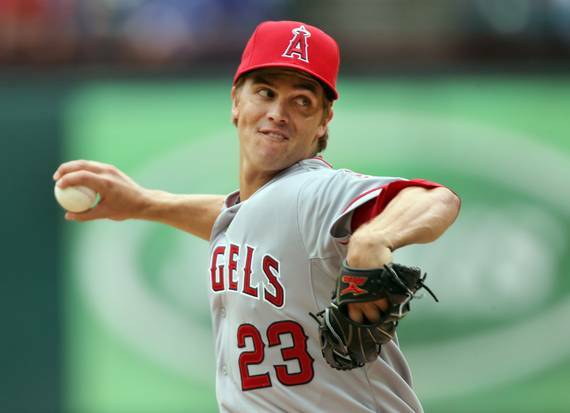 Shoulder injuries have done in so many pitchers. We waited for three years for Jason Schmidt to come back from one and he never was the same. Lilly was unable to pitch without pain in the minor league rehab starts. Then he suffered a back injury. Eventually it was decided to perform arthroscopic surgery on Lilly’s shoulder in September with hopes he’d be ready to come back in spring training. If Ted does come back, I see him either in the bullpen or traded to a club in need of a starter just before the end of the exhibition season in March. Aaron had his moments last year. Most notable, his 9 consecutive strikeouts against the Padres, in a game that he couldn’t even pitch long enough to earn a victory. Overall though, it’s unfair to claim Harang was mediocre. 10-10, with a 3.61 ERA in 31 starts was not at all shabby for a number 4 or 5 starter. My wish is that they consider Aaron in a one inning role out of the bullpen. Harang is the type of power pitcher that I can see being very effective if he is able to go out for one inning and air it out. His velocity can still be in the mid 90s if he throws with everything. That 6’7”, 260 pound frame can be an intimidating presence that I believe can shut down a teams in a key inning. Many would see that as a closer, but I have always been of the belief that the save is overrated and that often, the key situation for a reliever might be the 7th or 8th inning when a tense situation appears for the bullpen. 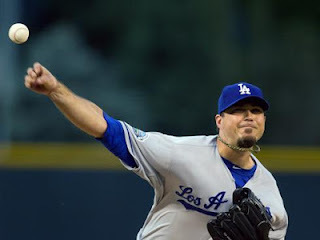 I’d love to see a guy like Harang come in with that fastball and mix his change, slider and curve when necessary. Just an idea. With that said, he’ll probably be traded. We’ll miss his super soaker squirt gun. Capuano is probably very disappointed with the way things have turned out. I believe he’s got a good shot to land the number 5 starting spot though. That’s because Ryu and Billingsley are big question marks. It would be very wise to keep Cap on the roster, even if he doesn’t crack the starting staff. As a long reliever he could be effective and eventually he’d be a solid man to step in to the rotation when injury rears it’s ugly head with one of the top five. It’ll be interesting to see how Capuano approaches Spring Training and how management judges his Spring Training effectiveness in the late exhibition schedule. Will he be pressing to make the starting staff, pitching for his life or will he be working and experimenting on his stuff in spring games? This doesn’t just apply to Chris, but to others as well. I have no idea what to expect. I think it’s safe to say that he’ll be given a legitimate shot to make the staff. Too much money has been spent ($36 million) to send him to the minors or the bullpen. The scouts love this guy and compare him to David Wells. We’ll all keep our eye on him this spring. 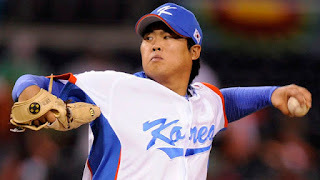 It’ll be interesting to see how Ryu adjusts to the MLB 5 man rotation. We saw how difficult this was years ago for Kaz Ishii ten years ago, who never really was able to make the adjustment. I’m hoping that this signing had more to do with the Dodgers asian scouting department being impressed with Ryu’s potential and not the marketing department’s excitement over getting the Korean community engaged with the Dodgers. He should have received Tommy John surgery because partially torn elbow ligaments don’t heal on their own. I think it was a risky move and if he were to have the surgery today, he’d be ready for next year. As it stands now, if Billingsley completely tears the thing or the injury worsens somehow after the season begins, we can kiss Bills goodbye until 2015. It’s a shame too because he was pitching so well in August of last season. I’m convinced that if Bills had been available in September, the Dodgers might have made the post season. It speaks to Chad's character and desire to be on a championship club, that he risks his career for the opportunity to pitch this year. Dave Stewart (Chad’s agent), knows pitching and I’m sure there is a method to their madness. They must believe that he can pitch through this and be effective. I hope they’re right, but if I were a betting man, I’d put my money on Billingsley landing on the D.L and being out for the season in the early part of the year. Hope I’m wrong. Boston fans warned us about Beckett saying he was a bad teammate. They said his best days are gone, that he wasn’t dedicated to the game anymore, etc. Truth is that he was awesome during the pennant stretch run. As a number three guy, Beckett is a great pitcher to have. And guess what? He didn’t cause any problems either. Beckett pitching in the NL West is helping his career. The AL band boxes didn’t help him. The rabid Boston fan base wasn’t in his comfort level. Los Angeles is a perfect fit for him. I really believe that Beckett is going to have a great year. Possibly 18 wins. Greinke impressed all of us with his baseball knowledge. How many guys out there follow each teams minor league systems. This guy is a cerebral type pitcher of the Greg Maddux ilk. He wants to be here and the tandem of Kershaw, Greinke and Beckett can dominate. A lot has been written about Zack and I don’t have a lot to add, other than I think this was the biggest free agent grab in the off-season. There isn’t much to say about Clayton and volumes have been written already. In my biased opinion, he’s the best pitcher in the National League. I do have concerns about his health though. We saw the hip problem surface at the end of the year and he suffered from plantar fascitis is as well. I’m wondering if the hip problem was caused by Clayton compensating for the foot problem. A healthy Kershaw means so much to this ball club. 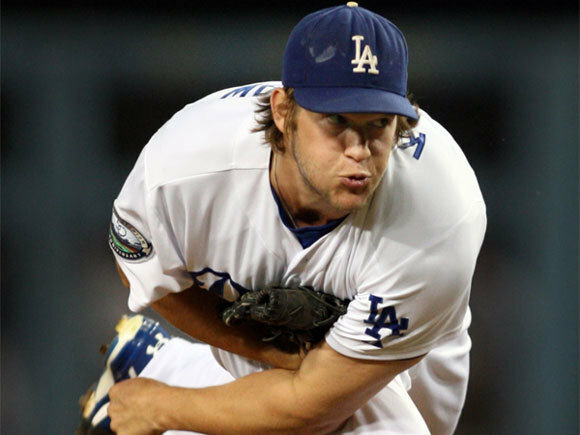 Probably the National League West crown is a given if Clayton has another Cy Young worthy season again. There you have it, 9 starters and 5 spots, (perhaps six if one becomes the long man in the bullpen). In the unlikely event that all emerge healthy in Spring Training, I see Fife in Albuquerque, Capuano as the long man and Lilly and Harang as trade fodder. A prolonged spring training due to the the World Baseball Classic will extend the competition and perhaps allow more opportunities for trades. 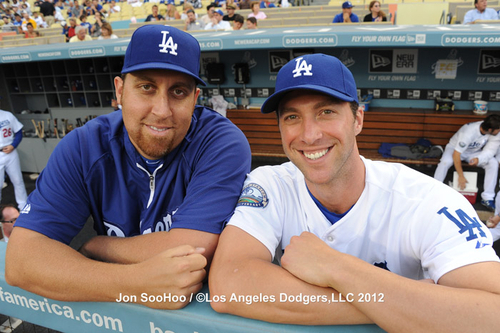 It's a nice problem to have and the Dodger starting staff is definitely the deepest in the Majors. So much room for contingencies exist. This may be the most interesting Spring Training we've experienced in years. 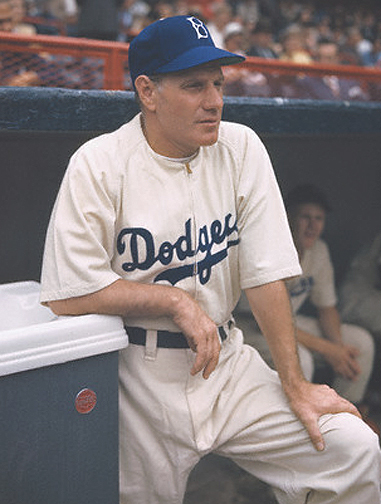 Over the next few seasons, Durocher and the Dodgers were identified practically as one in the same. Leo accepted a lessor role as a player as he approached age 40, but with his personality, “lessor” doesn’t adequately describe his role. He inserted himself in the lineup a few times during the war years when teams were depleted of players, but for the most part, his playing days were over. 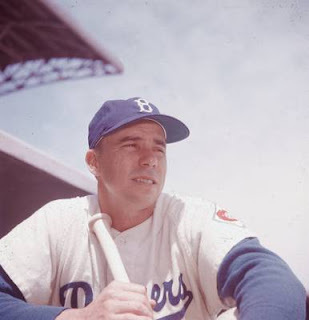 Up from the minors arrived his successor at shortstop, Harold “Pee Wee” Reese who Larry MacPhail had acquired from the Red Sox organization. Rather than feel threatened by the up and coming shortstop, Durocher took him under his wing and groomed him for the majors. “He would no more think of sleeping in the upper berth that he would of flying. But I knocked on the door one morning to see if I could take the youngsters to breakfast. There he was in the upper. He put them in the lower so they could look out the window in the morning. With two outs and a 4-3 lead in the ninth inning, Dodger catcher Mickey Owen mishandles a swinging strike three, allowing Yankee Tommy Heinrich to reach first base. This was game 4 of the 1941 World Series and the Yankees went on to a historic comeback and win the game 7-4. 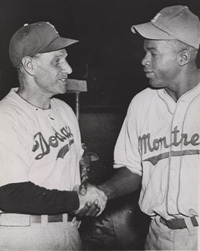 With Durocher’s managerial position, the teams emerging success and World Series appearance came the celebrity acquaintances. Leo befriended Jack Benny, Frank Sinatra, Milton Berle and Dean Martin. He frequented radio programs of the day, as other Gotham city field generals, (Yankees manager Joe McCarthy and Giants’ skipper Mel Ott) had no interest is such public attention. Durocher loved the national stage and as a result he became a household name. 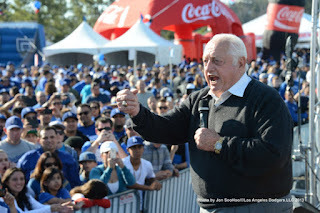 This didnt’ hurt the Dodgers’ popularity in the least either. Leo reveled in taking acting roles, always playing himself in staged arguments with umpires in prepared dialog. The money was good and it allowed Leo to live in high style by supplementing his baseball income. He had the best luxury apartment, top of the line clothes, ate in the best restaurants. It was complete extravagance for "the Lip." Durocher dated starlets and was living the high life in the most important city in the world. “The writers loved it. Bad Boy Durocher was in trouble again. That night, the Mirror and the News had it in their early editions, which hit Times Square a little after ten, so Leo had read all about the new rhubarb before he started back across the George Washington Bridge and up Highway 9W at midnight. “The next morning he was resplendent as usual when he came down to breakfast. The silk shirt bore no traces of a wrinkle, and you could have suffered a severe cut on the crease of his perfectly tailored slacks. Just a trace of Chanel No. 5 wafted along with him and his grin was ear-to-ear as he sought out Rickey’s table. “The Old Man looked up from his morning paper like a startled owl. ‘Who won the election, Mr. Rickey,’ said Leo mysteriously.‘What election?’ Rickey seemed puzzled. ‘You were running against Milton Berle, and I voted for you, that’s all,’ said ‘Lippy’ with some bravado. It was Leo’s association with gamblers (and reportedly ties to mobsters), that would get him eventually in trouble. Always one to engage in card games and billiard wagers, Durocher hadn’t backed off from these activities that dated back to his days on the hard streets of West Springfield, Mass. He'd spend the off season's in Los Angeles at the home of actor George Raft. Raft had ties to gansters and it reported that Durocher was even in the company of Bugsy Seigel while in Los Angeles. Upon Larry MacPhail’s return from the war, he obtained a 1/3 interest in the New York Yankees. MacPhail lured two of Durocher’s coaches over the the Yankees, (Charley Dressen and Red Corriden). Leo wasn’t happy about what his former boss had done and spoke negatively of MacPhail. MacPhail returned the favor. Accusations from each side hinted that they each had associations with gamblers that had invaded their clubhouses. Leo’s friendship with George Raft was mentioned. Larry’s issues with the bottle were made public. MacPhail was insistent that his friend, Baseball Commissioner Happy Chandler do something about Durocher. Allegations existed that Durocher and Raft had taken a large sum of money from another ball player in a rigged crap game. 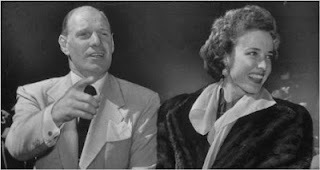 There was also a scandal with Durocher (twice divorced) involving his quick marriage to divorcee, actress Laraine Day. The Catholic Youth Organization (CYO), a large booster of the Dodgers Knothole Gang organization, dropped out of it on moral grounds due to the Durocher domestic situation. Happy Chandler held an impromptu investigation and interviewed MacPhail, Rickey, Durocher, Dressen, Parrott and others. It was a witch hunt from the word go, as MaPhail was insistent that the Commish put the hammer down on Leo. What resulted was a one year suspension for Durocher. Rickey was livid with the decision, but in the end, there was nothing he could do to stop it. Leo accepted his punishment and sat out the year with Laraine supportive by his side. The suspension was officially made public for “association with known gamblers.” There are those that believe that it had to do with the alienation of the CYO, a strong portion of the Dodger fan base. Whatever the reasons Chandler had, he probably knew coming in that something had to be done to Durocher to show he was an enforcer. Leo had alienated virtually all of the national League umpires too, often going to the press with his insults and complaints of their performances. He was still hated around the league and know for dirty tactics. To top that off, he was a popular figure who was often in the public eye. Club hopping, radio shows, advertisements, friendships with celebrities...Durocher was a well known face nationwide. There were a lot of jealous people in the game and many simply wanted to see Durocher out of it. Branch Rickey later reported that Larraine Day was just what Durocher needed to settle him down. She was his exact opposite and her influence soothed Leo. He followed her to become interested in things other that gambling, clubs and being seen in the public eye. Antiques, the arts, classical music and literature soon became a part of his life due to her influence. Laraine didn’t drink, smoke, or swear. She was a mormon and about the opposite of Leo in virtually every facet in life. Yet, they were an inseparable pair that dedicated themselves to their relationship. As the years went by, she became an enthusiastic baseball fan and his most avid supporter. Unfortunately for Leo, his days as Jackie’s manager would be short lived. The suspension hit shortly after his tirade with the players in 1947 and by mid season, 1948, he was on his way out and would soon be the Dodger’s nemesis for the next decade. It was an interesting turn of events, and one that would forever change the history of the game. Hero, Villian, Despised, Revered…Leo Durocher in Dodger History. Leo Ernest Durocher could be described with almost every adjective in the dictionary. He was about as controversial as they come. Colorful and outspoken. Certainly not dull. 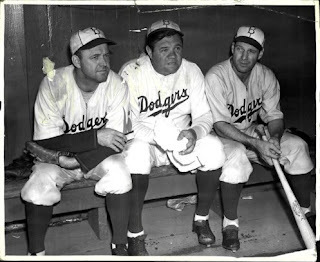 No person maintained as prominent a place in Dodger history during the 30’s, 40’s, 50’s 60’s and even 70’s as Leo Durocher. As a player, manager, coach, hated rival, hero, and even saboteur, this man played all roles and never minced words. Durocher could easily be labeled as a gambler, a great baseball strategist, a womanizer, a philanthropist, a manipulator, a charmer, a motivator and a cheat. And all in the space of 24 hours. Leo and controversy went hand in hand, all the way back to the 1920’s when he was a young ballplayer fighting Ty Cobb up until the 1970s when Cesar Cedeño played for him. He was a gold glove type infielder and weak hitting batter who in his best year hit .286. Born and raised in tenement housing in West Springfield, Massachusetts. He grew up on the streets with mobsters as friends. As a teenager, Leo learned to gamble, shoot pool and hustle with the best of them. It is said he learned the tricks of the scamming trade from the experts in those tough streets. By the time Durocher had broken into baseball, he was skilled at cheating in cards, hustling people and collecting debts. In 1925 he was playing in the minors with the Hartford A league club when Hartford Manager Paddy O’Connor caught him red handed with marked bills that he suspected his young shortstop would steal. Reports of missing money from other ball players pointed towards their young and brash shortstop. With his teammates wanting to beat him to a pulp, O’Connor insisted the Durocher remain with the club until the pennant race was over, with the promise that he’d get rid of him once the season ended. Hartford won and O’Connor kept his word, selling off Durocher to the Yankee organization for $12,000. Durocher continued in his controversial ways. He was up with the Yankees briefly in 1925 and to stay with the Championship team in1928. There his arrogant style, living above his means, and his show-offish nature rubbed teammates the wrong way. Nicknamed “Fifth Avenue” due to his flashy style and expensive tastes. He had penchant for dressing to the nines, something that his rookie wages could not afford. Durocher was always in debt and someone known for passing bad checks. The only thing that kept Durocher with the ball club was Manager Miller Huggins, who took a liking to the loud mouthed youngster. "Now, in those days, the Yankee dugout was behind third base - not first base as it is now and as I'm passing Cobb on the way in, he says to me, "You get in my way again, you fresh gusher, and I'll step on your face." I hadn't said a word to Cobb, and I still didn't. Hell, this is Ty Cobb. But Ruth, who was coming in from left field, wanted to know what Cobb had said. 'Well kid,' Ruth said - he called everybody kid - 'the next time he come to bat call him a penny pincher.' I'd never heard that word before, but just from the way everybody on the bench started to laugh I had a pretty good idea what it meant. What I didn't know was that Cobb had a reputation for being a very tight man with a dollar and had been ready to fight at the drop of a 'penny pincher' for years. Well, naturally, I can't wait for him to get up again so I can go to work on him and holy cow, he turns in the batter's box, pointing his finger, and the umpire has to restrain him. Now, the game is over and the umpires don't have a care any more. Both clubs have to use the third-base dugout to get to the locker room, and Cobb races over to cut me off. He's out to kill me and I'm looking for a place to run because I am not about to tangle with Mr. Cobb. Finally, Babe came running in and put his arm around Cobb, and he's kind of grinning at him and settling him down. 'Now what are you going to do? You don't want to hit the kid, do you?' And while Babe has his attention - boom - I'm up the stairs like a halfback and into the locker room." 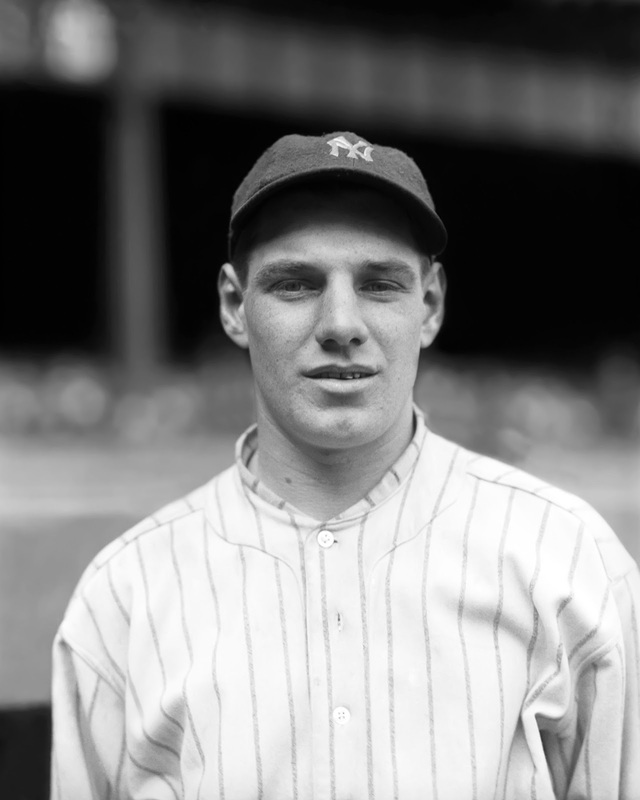 The Ruth-Durocher feud would re-surface years later when they were both with the Dodgers, but in 1929, when Miller Huggins passed away, Durocher’s playing career looked to be over. The Yankees placed him on waivers and no American League club wanted to touch the arrogant, slap hitting shortstop that had an unsavory reputation. This was quite the story because though Durocher wasn't much of a hitter, he was already known as probably the slickest fielding shortstop in the league. The National League’s Cincinnati ball club claimed him and he was told to be on good behavior by Red’s Manger Dan Howley. Durocher played well in Cincinnati, but continued to get in trouble by passing bad checks, getting knee deep in a paternity law suit and alienating those that came in contact with him. 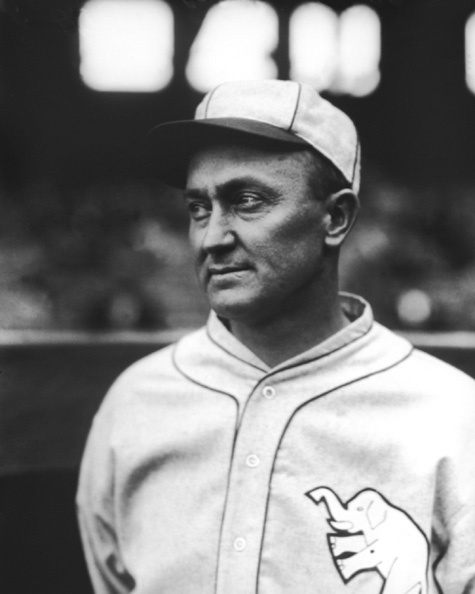 Three years later, the Cardinals Branch Rickey traded for him when his shortstop, Charley Gelbert, nearly shot off his foot in a hunting accident. The "Gas House Gang," poses before game 2 of the 1934 World Series in Detroit. Durocher is 2nd from the left. 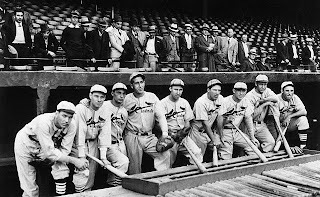 Dizzy Dean, is first player on the left. Rickey was concerned with Leo’s debts. He continued to live above his means, writing post dated checks and making enemies both outside and inside the lines. Commissioner Landis got involved this time around and Rickey assisted getting Durocher an off-season managing gig with the U.S. Naval Academy to help him pay off some of his debt. It was there that Durocher got a taste for managing and he liked it. By 1937, Durocher was convinced that he could do a better job managing the Cardinals than current skipper Frankie Frisch and he was very vocal in expressing his opinion. The Red birds had fallen into fourth place. Branch Rickey, in an attempt to release club tension, traded Leo away to Brooklyn in 1938. This didn’t stop Durocher in his quest to become an on-field player/manager. 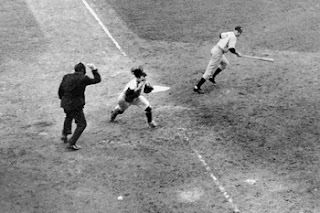 It was over this spat, while with the Dodgers, that Durocher and Babe Ruth went head to head. After two years at the helm of the Dodgers, Burleigh Grimes was on the way out after two sub 70 win seasons. Ruth had come over to Brooklyn in June of 1938 with aspirations of becoming the on field Manager to replace Grimes. Brooklyn President/General Manager Larry MacPhail had brought on Ruth as a first base coach as a possible gate attraction with a latent promise that he would be considered for a future managerial position. Truth was that the Babe was a gate attraction, but the fans mainly loved watching him take batting practice periodically. MacPhail was prepared to shatter the Babe's dream of managing. Unfortunately for Ruth, a determined Leo Durocher wanted the managerial job just as much. The two men already had a stormy relationship over the years with each each other. This was a conflict that was to be of “Ruthian” proportions (pun intended). 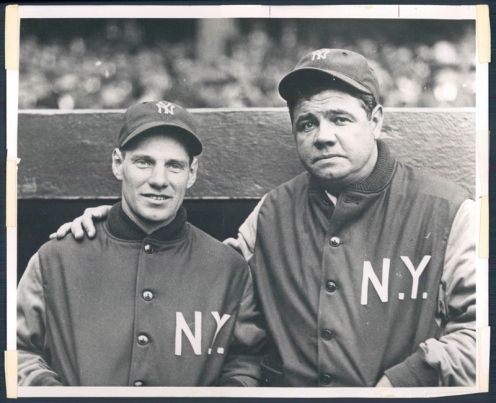 Burleigh Grimes, Babe Ruth and Leo Durocher. 1938, Brooklyn bench. If there was one thing that Leo had as a personal trait, it was an uncanny ability to achieve his goals, no matter what the cost. As despised as he was by his teammates, team management and the administration of major League Baseball, Durocher's stubborn nature seldom failed to get him what he wanted. A determined Leo Durocher more often than not would reach his goals. Discrediting the Babe would work in his favor to get the Dodgers managerial job. 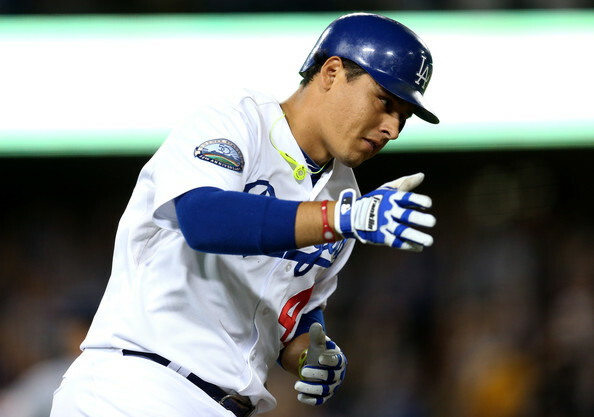 He claimed that Ruth missed relaying a “hit and run” sign that cost the Dodgers a game. (This was confirmed in Claire Ruth’s writings at a later date, who confirmed that the Babe's poor memory was at fault for the mental error). The two went to fisticuffs in the club house. Michael D’Antonio in his book on Forever Blue, described the tense spectacle of Ruth and Durocher’s feud in this way: “Durocher took every chance to humiliate the aging star (Ruth), right down to slapping him and calling him a baboon during a clubhouse confrontation. 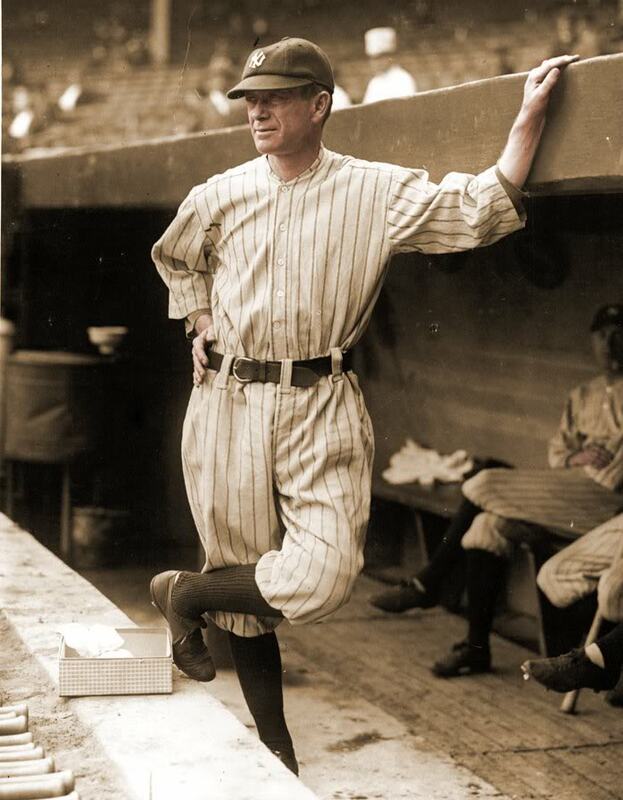 He gradually destroyed the Babe’s chance to become manager and got the job for himself.” Larry MacPhail, who had his own controversial nature, (was known to have serious problems with associations with gamblers and alcoholism), eventually selected Durocher as Grimes' successor. Ruth departed the organization an extremely disappointed and disheartened man, never to be seriously considered for a field manager job again. The selection of Durocher turned out to probably be the best move MacPhail could have made as Leo was able to improve the Dodgers by 15 games in the standings in 1939, finishing in 3rd place. It was the Dodgers first winning season in seven years. Leo then led Brooklyn to its first pennant in 21 years in 1941, finishing with a 100-54 record. Amazingly, the ’42 Dodgers won 104 games, but failed to take the National League crown as St. Louis finished with 106 wins. 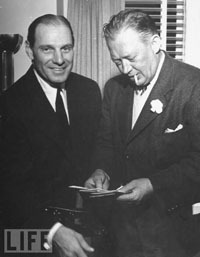 Durocher and Larry MacPhail in Life Magazine photo. The MacPhail/Durocher relationship was rocky from the start. MacPhail was known to have drunken temper tantrums in which he’d fire Durocher, only to rehire him the next morning after sobering up. 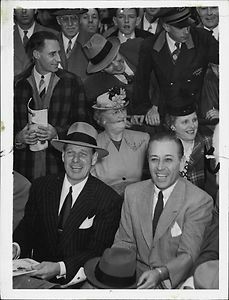 It was reported that this occurred about a dozen times during their stormy years together with the Dodgers, but in 1942, MacPhail left the team to serve his country in World War II, and once again, Durocher found himself working for his old nemesis, Branch Rickey. In the next half a dozen years, both Rickey and Durocher found themselves and loyal allies, and men that would impact the baseball world (and the country) in a major way. 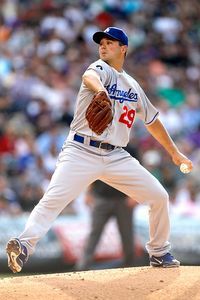 LOS ANGELES – Hall of Famer Sandy Koufax will return to the Los Angeles Dodgers in 2013, it was announced. Koufax will serve as Special Advisor to Dodgers’ Chairman Mark Walter. Koufax will attend a portion of Spring Training to work with Dodgers’ pitchers and consult with the team throughout the year. “For our young players and our veterans to be able to tap Sandy’s expertise and counsel during Spring Training and throughout the season will provide yet another tremendous resource in our efforts to strengthen our club,” said General Manager Ned Colletti. Koufax, the first major leaguer to pitch four no-hitters, including a perfect game, was the youngest player (age 36) and the first pitcher inducted into the Hall of Fame (1972) who had more strikeouts than innings pitched. In 12 major league seasons, he had a career record of 165-87, a 2.76 ERA, 2,396 strikeouts, 137 complete games and 40 shutouts. From 1962-66, Koufax led the National League in earned run average and shutouts. He was the first pitcher to average fewer than seven hits allowed per nine innings pitched in his career (6.79) and to strike out more than nine batters (9.28) per nine innings. In his last 10 seasons, batters hit .203 against him with a .271 on-base percentage and a .315 slugging average. Koufax was the MVP and Cy Young Award winner in 1963 and also won Cy Young awards in 1965 and ’66. He was a member of Dodgers’ world championship teams in 1955, ’59, ’63 and ’65, earning MVP honors in 1963 and ‘65. His postseason record was 4-3 with a 0.95 ERA. He was selected to seven consecutive All-Star games from 1961-66. Great news. Let me just add that we, as fans, need to allow Sandy to have his privacy. He knows we revere him. He's not too keen on that because he's a humble guy. Let's let the man be and simply give him some space to help the ball club. My .02.